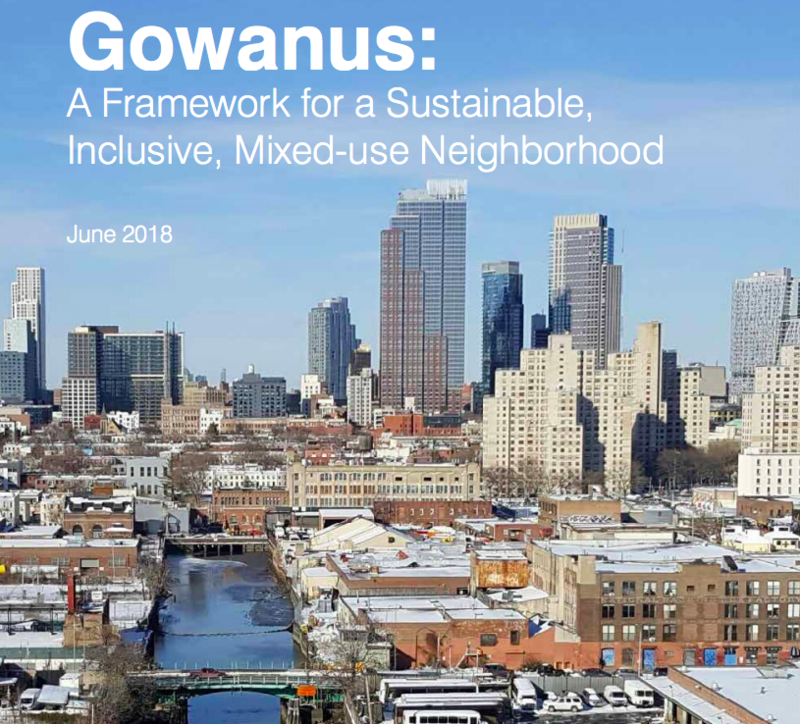 GOWANUS – The NYC Department of City Planning (DCP) presented its long-awaited “Gowanus: A Framework for a Sustainable, Inclusive, Mixed-Use Neighborhood” to Community Board 6 Monday evening after releasing the document last week. The framework was developed after a year and a half of community members and stakeholders participating in more than 100 hours of workshops and working group meetings, providing feedback on how they’d like see, or not see, Gowanus reshaped. The framework outlines the goals and strategies the community and DCP have compiled to make the neighborhood a thriving, resilient, and inclusive place to live and work. “We have been working with the community for a number of years and have updated the [community] board with key milestones along the way. 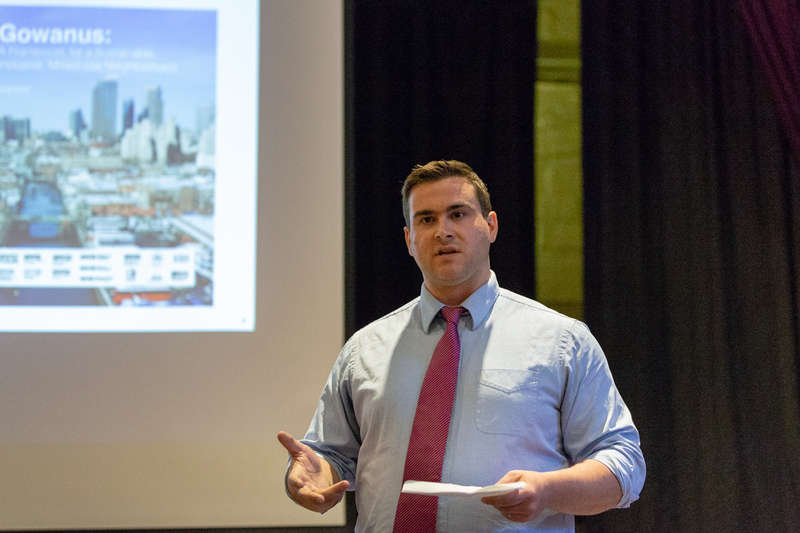 This is one of those key milestones, sharing a framework on the way to our goal of creating a Neighborhood Plan,” said DCP Project Manager Jonathan Keller at the start of last night’s meeting held in the auditorium at PS 32. 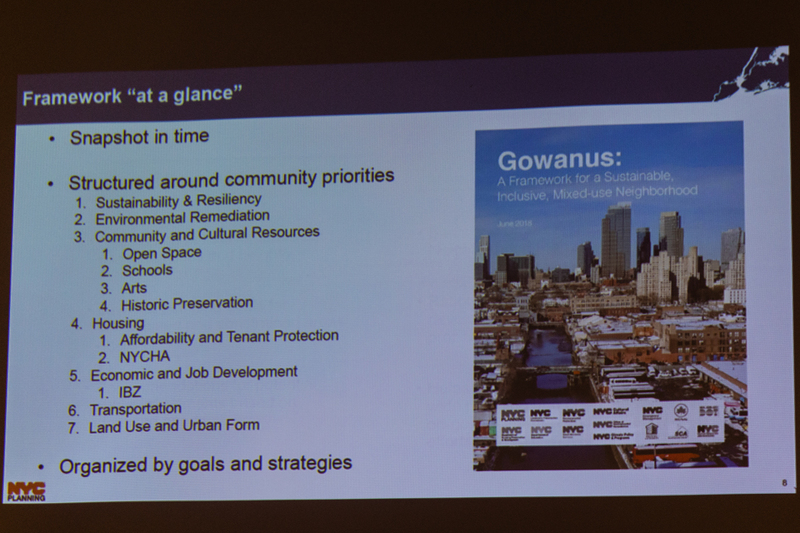 The Gowanus Framework focuses on community priorities which are divided into seven chapters: Sustainability and Resiliency; Environmental Remediation; Community and Cultural Resources (open space, schools, arts and culture, historic preservation); Housing (affordability and tenant protection, NYCHA communities, MIH or Mandatory Inclusionary Housing); Economic and Job Development (focusing on the Industrial Business Zone, or IBZ, which is not a part of the framework); Transportation; Land-Use and Urban Form. 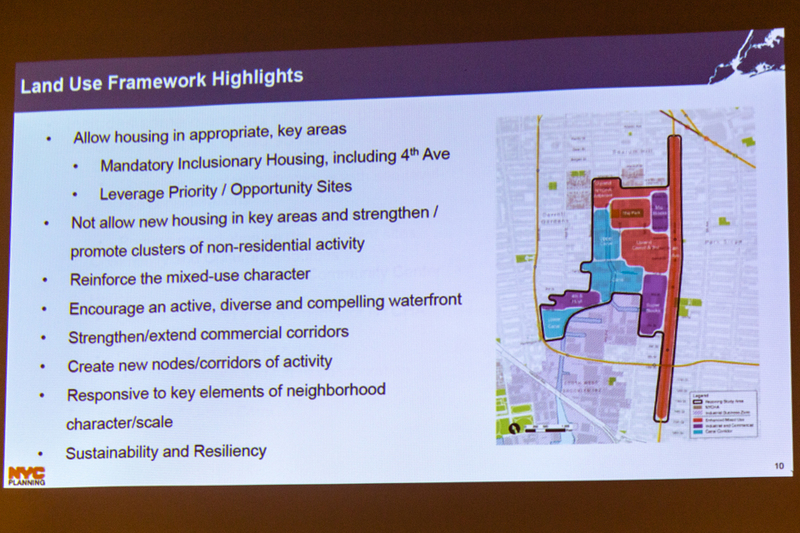 The framework includes some elements of what a Neighborhood Plan will include based on what DCP has heard so far. “Frankly this is because of the close partnership we’ve had with all of you, the amount of hours we’ve put into this with all of you and you have with us, and the community leadership,” Keller noted before listing a few of these priorities including: ensuring that new development can provide a neighborhood-wide level of resiliency and sea level rise adaptation strategy; requiring new development to remediate the brownfields throughout the neighborhood; reopening the Gowanus Houses Community Center; assessing and considering the funding for improvements to the three NYCHA communities in the study area; and investing in the health and vitality of the Gowanus IBZ (including $34 million in upgrades to the water/sewage infrastructure and bringing broadband to the zone). Keller noted that the framework includes 30 to 40 pages on land-use highlights. “We decided the best way to shape it for digestion in the community is to create sub-areas. 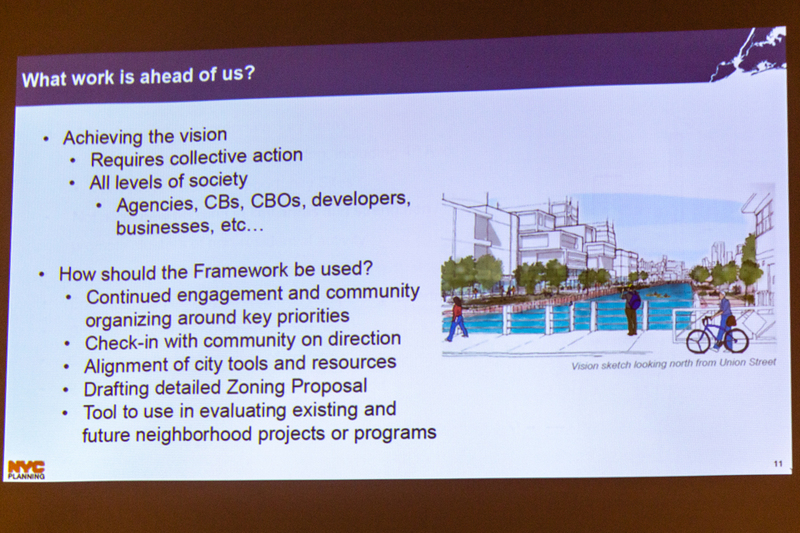 Each sub-area has vision statements, goals and strategies about potential land-use changes or zoning mechanisms. 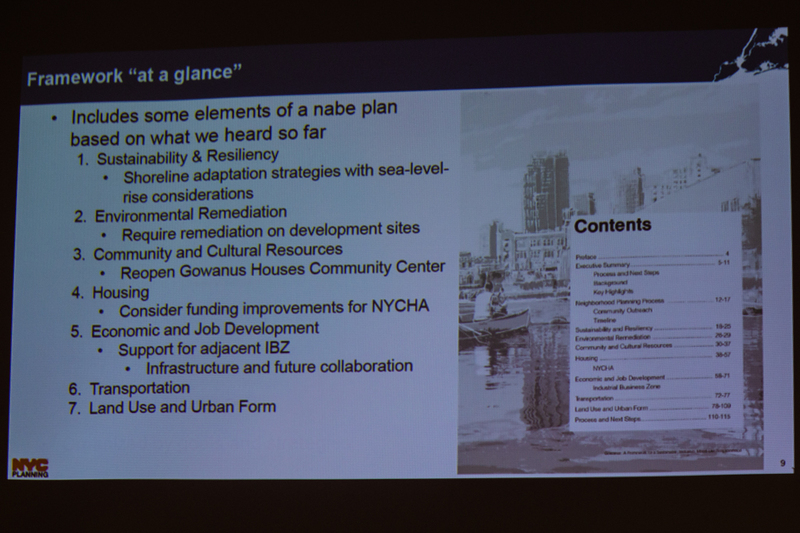 It can sometimes get a little technical so we can clarify things in the document on June 27” when DCP will host a Gowanus Framework Open House where 16 other city agencies who helped DCP create the framework will be present to answer questions from locals. Some of the key land-use aspects include: reinforcing the mixed-use character of the neighborhood; encouraging an active/diverse/resilient/compelling waterfront; strengthening and extending commercial corridors; and creating new areas of activity. “We’re trying to do this while responding to key elements of the neighborhood’s scale and character” while also considering sustainability and resiliency, Keller said. The community is strongly encouraged to submit their comments, feedback, and ideas to DCP either via email gowanus@planning.nyc.gov or PlanGowanus.com. 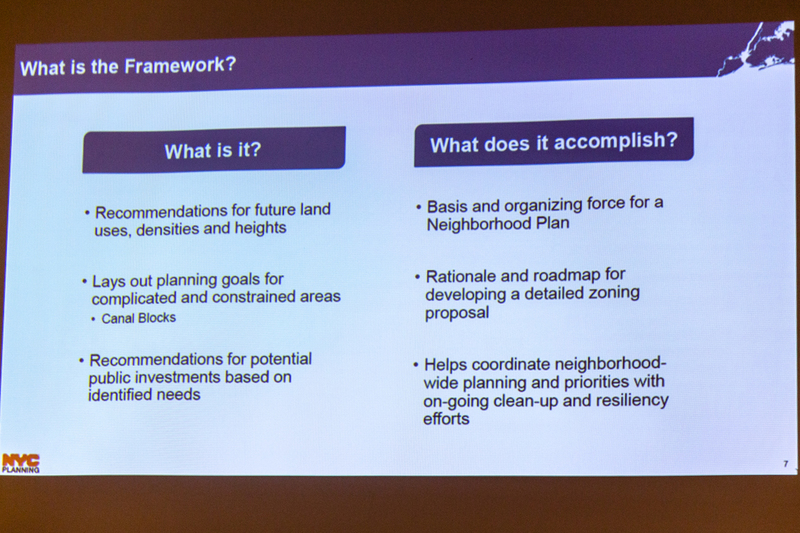 After sharing the framework and collecting the community’s feedback on it, DCP will develop a Neighborhood Plan or draft rezoning proposal by the end of the year. Keller assured the audience that the agency will continue to engage the community around the goals and strategies identified in the framework. “It’s a little bit more complicated than that,” Keller responded. “Public Place is not in the legality only for public parks, it’s for public purpose. We will be having a workshop where the development team, selected by HPD a number of years ago, will be working on refreshing a lot of the visioning which had been done with the community a number of years ago.” He added that the workshop will discuss the potential of adding affordable housing in the park space. “We’re a long ways away from addressing any proposal entering formal ULURP,” Keller replied. “One of the important aspects of the framework is that it can be used as a tool to evaluate plans for the future beyond just this study process. The really great part about having a detailed framework is it does put out there the community’s priorities,” and can be used later to evaluate future developments. When questioned about how high developers will be allowed to build on 4th Avenue, Keller replied: “We’re seeing 12 to 17 stories on 4th Avenue under the framework. Right now, a portion of it is already zoned which allows for 12 story buildings. That portion of 4th Avenue we would like to map MIH on, which does require an upzoning to get MIH legally, which is why we’re showing up to 17 stories.” Keller noted there would be design requirements for these high-rise developments, such as set-backs. Ben, a Hoyt Street resident said, “When I hear rezoning, I hear developer give-away. If we’re going to have reconstruction all over the neighborhoods, how do we make this livable long-term?” he asked Keller. “That is a high-level goal of this entire thing. This whole framework will allow us to better coordinate, ” Keller insisted, adding that the hope is that advocacy will help ensure that quality of life and safety is maintained. When questioned about the addition of new schools, Keller explained that DCP is working closely with NYC SCA [School Construction Authority] to determine good locations for schools in the district, how many school seats will be needed, when they will be needed. “These are hard issues to talk about. We feel so conflicted about them. It’s a big and growing city, we know we need more housing, we know we need more room for jobs. 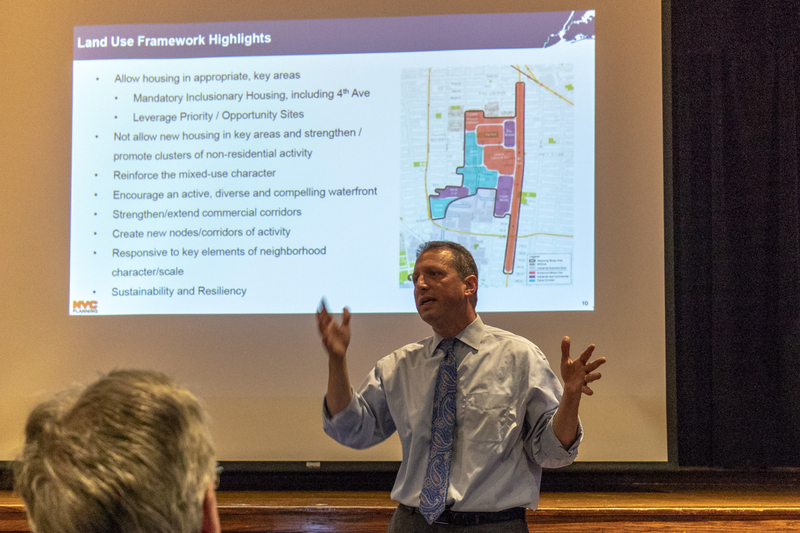 We love the neighborhood and its scale, and we don’t want to see the things that we love changed or eroded,” Council Member Brad Lander said near the close of the meeting. “This is still the last step of the first part of the process. We have a long way to go,” the Council Member added. “I’ve had the fortune and/or misfortune of working on several rezonings and will say that without a doubt, this process has been the most inclusive I’ve ever seen,” said Community Board 6 Chair, Sayar Lonial. He informed the audience that the board will draft a letter to DCP prior the the Open House on June 27 detailing the “aspects of the framework that we are very excited about and hope to have remain in the rezoning…as well as those ideas we think need to go further and [those that] need to be added to the framework.